Last night I was making potato salad and tuna salad when I ran out of mayonnaise. I usually have a jar of Best Foods Real Mayonnaise (Best Foods is also known as Hellmann's) in the refrigerator, but this time I forgot to buy some more when I ran low. Although I have made my own mayonnaise in the past (usually for special occasions because homemade mayonnaise is so good), I usually prepare recipes with the store bought variety because it lasts about six months in the refrigerator (while homemade might last up to week). Of all the brands available, I find the Best Foods (or Hellmann's) brand to be the best tasting and most natural (fewest unidentified ingredients) of the supermarket mayonnaises. Too lazy to leave my home in the middle of food preparation (and too nice of a guy to send Tina on a mayonnaise buying errand), I grabbed a clean bowl and my whisk to make some of my homemade mayo. All you need are two large egg yolks, 3 tablespoons of lemon juice, 1/4 teaspoon salt, a pinch of white pepper, and 1 cup oil. I ran out of lemon juice last night (I just keep running out of ingredients), so I used about 1 tablespoon lemon juice and 2 tablespoons of lime juice. I also froze the two large egg whites in ice cube trays for later use. For the oil, I used extra light olive oil because of its very faint (almost nonexistant) flavor and nutritional and health properties. I put the yolks, lemon juice, salt, and pepper into my mixing bowl and whisked until smooth and light. I then whisked the oil, a few drops at a time, into the mixture. I made sure the mixture was smooth and well integrated before pouring the next few drops of oil. 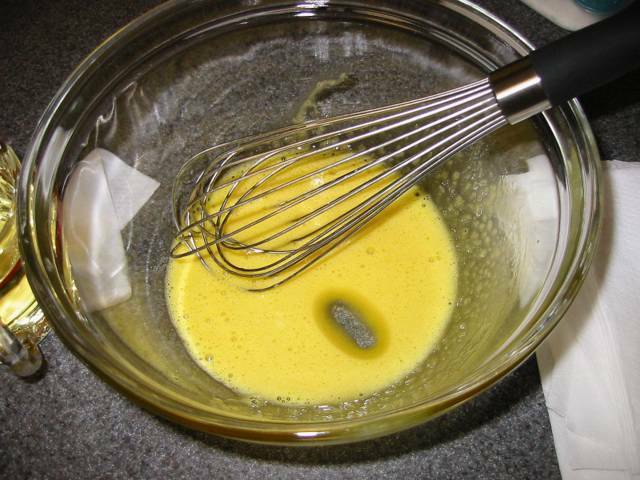 The whisking will suspend the oil into the yolk mixture and adding the oil a little at a time will keep the mixture in a state of emulsion - which is what we want. After about 1/3 cup of oil has been whisked in, you can speed up the pouring a bit. Make sure the mixture is back in emulsion before pouring any more oil. Once all the oil has been whisked in, you have mayonnaise. This is a good time to add any extras, a spoonful of dijon mustard and extra salt and black pepper is usually what I add. Because handmade mayonnaise is mostly egg yolk, the mayonnaise will have a healthy yellow color. Store bought or machine made mayonnaise usually also contains egg whites which will lighten the color up as well as lighten up the flavor. Anything you don't use immediately, put it in a jar and refrigerate. It should hold for half a week to a week. You might note that I called both mayonnaise and vinaigrette dressing emulsions. But, a vinaigrette eventually seperates while mayonnaise maintains its state of emulsion. This is because of the egg yolks which contains a substance called lecithin (an emulsifier). You may have seen lecithin as part of the ingredient list of store bought ice cream and salad dressings. This substance when mixed with water (the lemon juice) and oil (the olive oil) helps hold the two together in suspension. Of course, if we kept mixing more and more oil into the mixture, we would eventually overwhelm the emulsifier and the whole emulsion would separate (at least that's what I'm told, maybe one day I'll do it to see what happens when you mix in too much oil). I use a blender set on low to medium instead of a whisk. When you go to open your bottle of oil don't take the little foil seal off. Just poke a tiny hole in it with a toothpick. This way you can squirt a fine stream of oil into the blender while it it running. Here is my OP (olive oil parmesan) dressing. Add some shredded parmesan (to taste). until it has the consistancy of a mayonnaise spread. This doesn't make much so you may want to double the recipe. 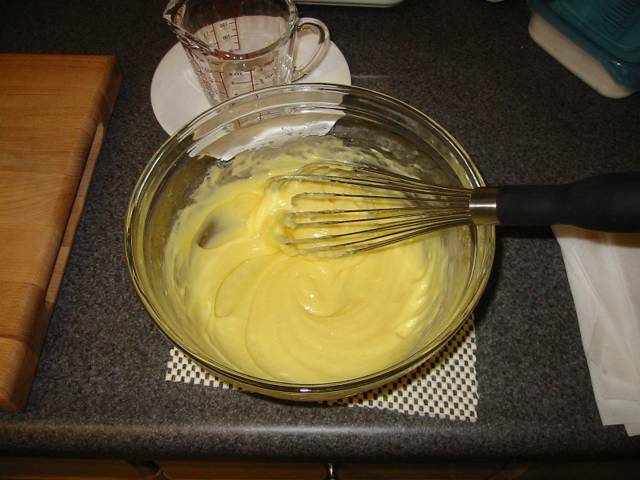 My grandmother used to make mayonnaise without the lemon juice, but with a tablespoon (or two) of mustard. 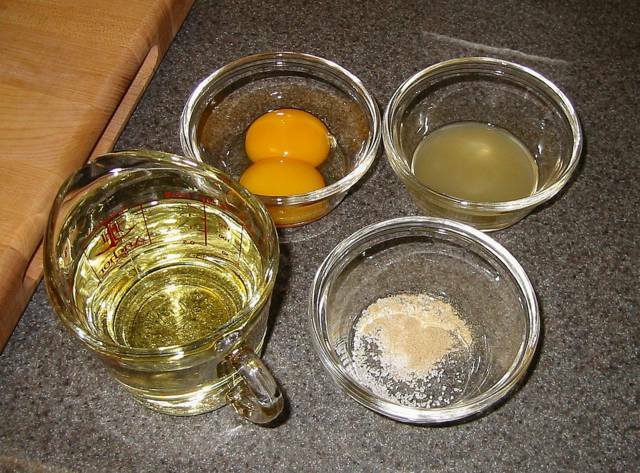 The mustard is added at the beginning, though, and mixed with the egg yolks before the oil is poured in. There's a type of mustard sold here (I live in Flanders, the northern region of Belgium) where the mustard seeds appear to be grinded only slightly and the 'skin' is still visible. This makes the mayonnaise look quite nice. Cuisinart pushers have a small hole in the bottom that drips the oil in a just the right rate, and the combination of the motor and the cutter blades are just right for lazy me. Using essentially the same recipe you use (I add a touch of cayenne) the process became so automatic that I put my then-6-year-old son in charge! a slight variation on the same theme: start of with mustard, egg yolks, a bit of vinegar and a pinch of salt. Mix in the (flavourless) oil to make your mayonaise. Then, to make (cold) tartar sauce, you can add finely chopped capers and pickles, and if you like garalic, you can add that too. I just wanted to share a little tip for mayonnaise that separates. I doesn't always work but if you put your separated mayonnaise into a food processor and whilst it is whizzing around, add a slug of hot water it usually fixes the problem. I don't know why this works but it does. I'll have to try it. The family receipe I usually use for mayonnaise is close to yours. But it uses white vinegar instead of lemon juice (2tbsp) and one whole egg instead of 2 yolks. We also put dry mustard to the starting mixture, and use half olive oil/half canola oil. That gives a much whiter mayo. It seems that the emulsion is easier to loose (separates when you stir too much) if we use less olive oil. a nice and very simple way of making a mayo, but I would like to ask if instead of lemon juice can I use calamansi juice? and instead of olive oil can I use regular cooking oil? because I would to share this to my ate who sell a hamburger,and I thought maybe its a little bit helpful if she makes her own mayo using cheap ingridients. 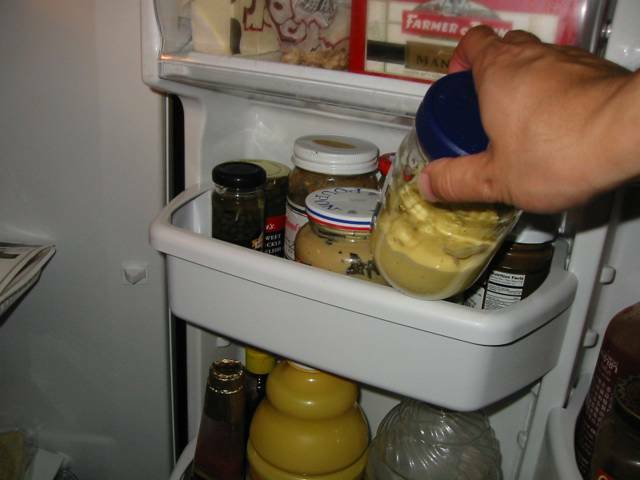 Any vegetable oil can be used to make mayonnaise. I prefer oils with little flavor (canola or light olive) as opposed to oils with a stronger flavors (corn oil, peanut oil). Calamansi juice will probably work. Generally, I find most people use vinegars or lemon juice. Calamansi might not be as acidic as either, but could produce a nice flavor unique to your homemade mayonnaise. I use whole eggs which I heat to a temp of 160 degrees and set off stove for two minutes (gauge with candy thermometer) This will kill any potential harmful bacteria, thus extending the keeping time. I then put all ingredients in a pint jar and fill with peanut oil. Place a "Stick blender" all the way to the bottom of the jar and slowly blend back to the top about 5 seconds. Instant mayo! After the emulsion starts to hold and you add a tad more oil, it'll start to become more solid. If the emulsion has broken, then it'll separate. Only when you've got an ample amount of oil suspended, can you start drizzling. I finally tried to make it in a food processor so that I could maintain constant movement but I honestly think that my problem was that I gave up too soon and there wasn't a high enough ratio of oil to the egg/lemon mixture for it to thicken. Anyway, this batch worked---not exactly perfect but I'm sure with experimentation I'll get it down, maybe even with doing with a hand whisk. Thanks for your posting, pictures and directions. Great site! is there any need to cook the eggs or the final product, is it safe to eat say a sandwich with this mayonase on it, since it has raw eggs in it?